We finally have matching nighstands! This is actually the first time I’ve had a proper nightstand on my side of the bed. For the last few years I’ve been either living without one or just had a basket to hold my reading materials. 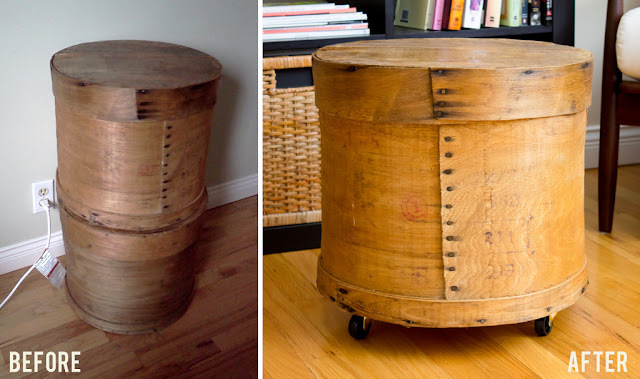 The Dude has had a series of salvaged nightstands we picked up from various places. 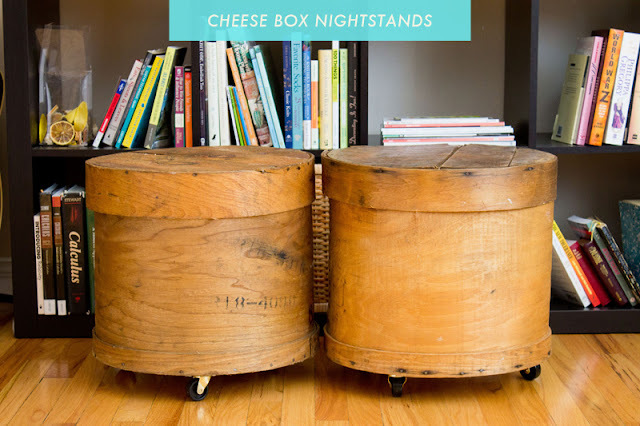 So a few weeks ago I bought a pair of vintage round cheese boxes from Stepback for the purpose of using them as nightstands. 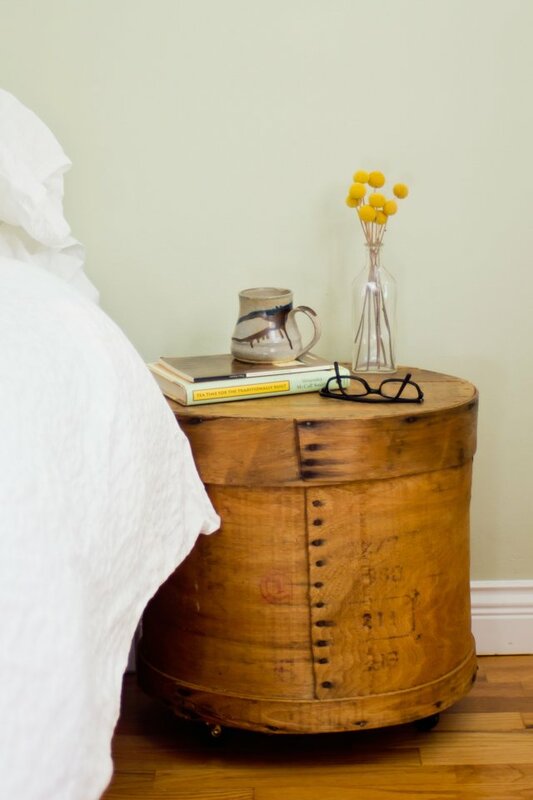 I really like that they’re round, which provides a nice contrast to the big rectangular bed and dresser. 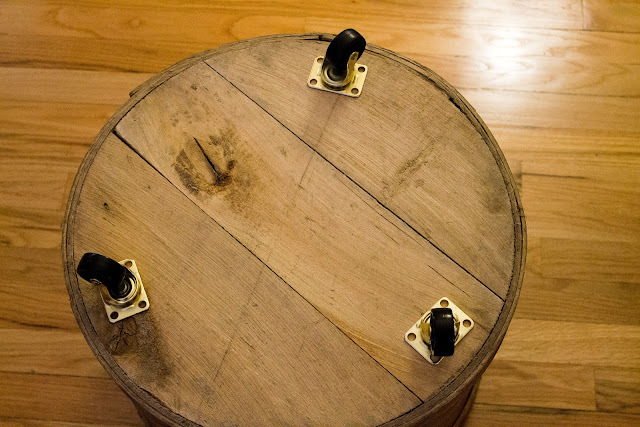 We just slapped some castors on them to make them a bit taller, and because I like putting castors on just about any piece of furniture! This was a simple, instant gratification DIY project, and I’m so pleased with the results! I especially love the seams on the cheese boxes, particularly on the one right above with the numbers stamped along the side of it. Back in the old days these boxes were used to age cheese. 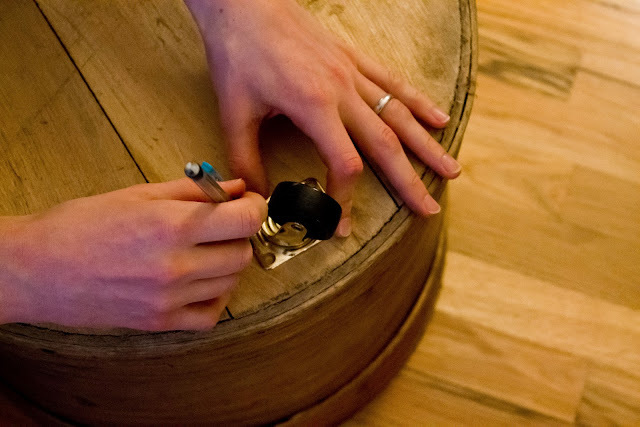 Here’s a play-by-play of how we attached the castors onto the cheese box. Turn the cheese box upside down and position the three castors to where you want them to be. Use a pencil to mark where you’ll drill the holes. 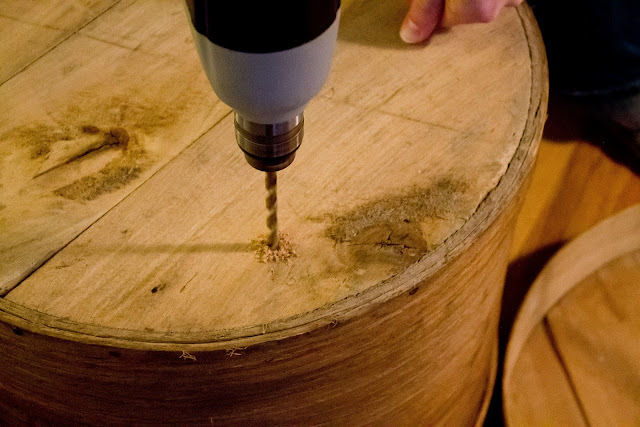 Use the right sized bit to drill the holes. 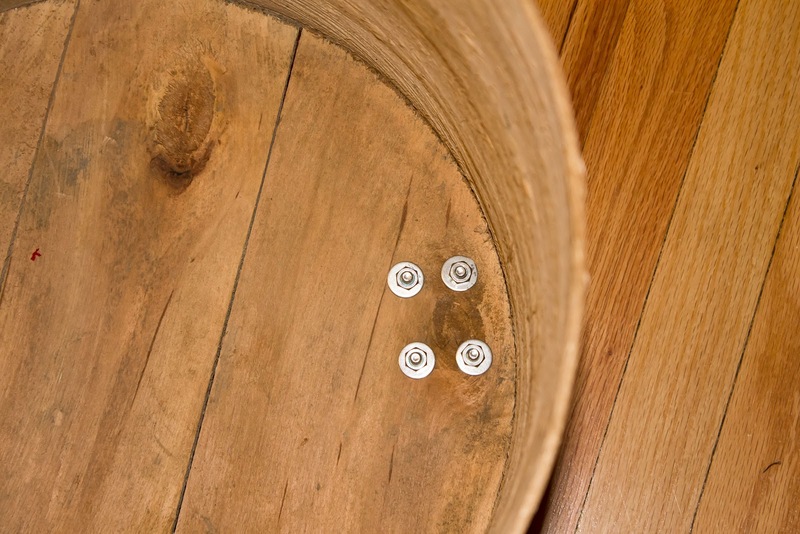 Fasten the castors to the cheese box with the bolts. 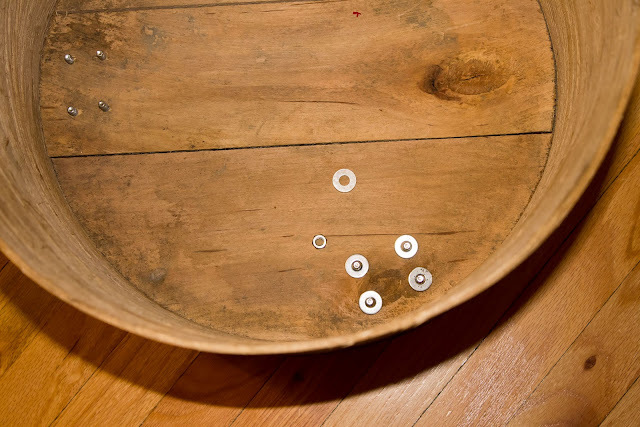 Turn the box over carefully and place the washers over the bolts. Fasten the nuts to each of the bolts and you’re done! They look old and lovely. 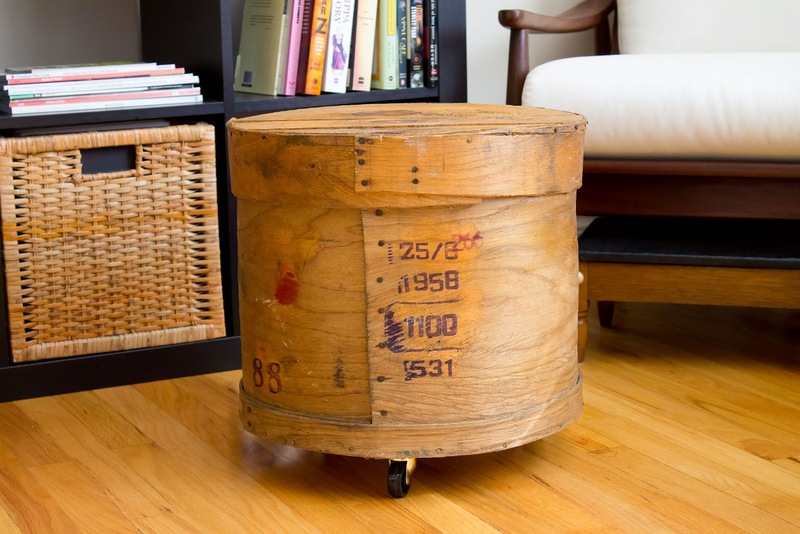 It pleases me to no end when we’re able to acquire a used piece of furniture (or in this case a used item repurposed as furniture) instead of buying something brand new. One of my decorating mantras is to use preloved furnishings as much as possible because it’s better for the environment and, to boot, they provide a lot more character than something that was manufactured recently. I love them, I have never seen cheese boxes before, fabulous!! I love these Alice! Great results! wow! You did an awesome job!